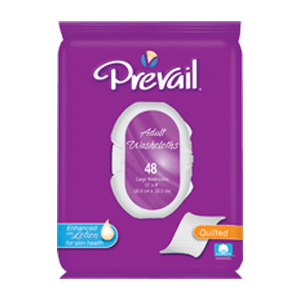 Prevail® Premium Cotton Washcloths are made with a thick, super strong and super soft, cotton-enhanced fabric. These washcloths are designed to be gentle on the skin and durable enough for tougher jobs. The quilted texture creates pockets for a more complete cleaning with overall less waste. With Single Hand Dispensing®, a single, unfolded washcloth dispenses for added convenience and less waste. Super strong and soft fabric. Kendall White Washcloth 10" x 13"